The Scots well-known by their stubbornness. The stepchildren of Great Britain they thank their stubbornness not only not forget traditions and customs but live according to them. What are their wedding traditions? What they wear? What are their rituals and unforgettable traditions to which they are so committed? It is a coin which was in use in Great Britain before. It was an iron coin in 17 century there was a tradition to give it to a groom, but later the coin has become as a lucky totem and the Scots begin to put it into the bride’s shoe. Today this tradition a little changed. It can be put in the bride’s wedding bouquet or add to wedding necklace. After the wedding when the bride is getting into a car, her father throws trifles in the air. All children rush to gather them from the ground. A tradition like this exists in a different country. The countries can be very far from each other and have the same traditions. Who knows how this wedding tradition was traveling from country to country? In Scotland, this wedding custom symbolizes a prosperity and welfare. In some Scottish weddings guests holding each other’s hands and dance from a port or common square towards their village. This dance is performed at the end of the wedding. As the dancing group goes forward, people who reached their houses, go out from the dancing chain and go home. The bride and groom are the last couples! This tradition can be performed only in small villages; it’s a very unique and nice tradition which doesn’t exist in other places. None of the suitors dreams and wants the tradition which called Groom Blackenings. Maybe this wedding custom is a heritage fo dark and ancient times when a man was should be strong and was should be able to pass some cruel tests and exams. The groom’s friends make him backed into a corner and despite his resistance tie his hands to his body. After, they color him with the black mixture of honey, ash, feather, flour, and soot. When it is over? His friends ( i. e. the perpetrators) make terrible noises and after their satisfaction with the groom's situation untie him and clean. Unfortunately, in some places in Scotland, even the bride may be subjected to this torture. As we all know the bride and groom are centers of a Christian wedding and they play a very crucial role during all wedding, all traditions revolve around them. Bringing gifts to the newlyweds today is a wedding tradition. The bride’s girlfriend gives a gift to the bride a tea set and the head groomsman give a gift to the groom an expensive watches. There is one more a very interesting gift for a Scottish wedding. During the decoration of the bride and groom house, they hang the decorative bell in one part of a house. In case of quarreling between the groom and bride, if one of them will ring the bell the quarreling is over and should stop. One of interesting wedding tradition is the carrying a stone by the groom. And how heavy this stone will totally depend on the bride’s desire. The groom can’t leave the stone until the bride kisses him. This tradition symbolizes the groom’s power and shows how strong he is. This tradition exists in some regions of Scotland. This tradition is like a Groom Blackenings tradition which was described above but for the bride. But it’s not so cruel; brides are more lucky in this case. Because the bride’s girlfriends perform this custom, not on the wedding day but 3 days before. They steal the bride and execute this torture. They pour on the bride eggs, butter, cheese, fish and other foods, all that they have in today’s menu! Maybe this tradition came from unkind unmarried girls? This tradition which embodies the happiness and welfare life of the newlyweds, associated with brides. This tradition in top list Scottish wedding traditions. The bride sits down a chair, an old age woman, who has a happy marriage washes the bride’s feet and dry them. In some Scottish regions young girls join this tradition as well. When foot washing is over, inside the basin is putting the wedding ring. A girl who first will find it will be the next bride. When the newlyweds go out from a church on two sides of church’s door they see two baskets filled with ribbons and tied to each other. If the bride and groom will be able to untie them, baskets fall to the floor and all ribbons scatter on the floor. There is a belief that this ritual brings happiness to the newlyweds. First what comes to our mind when we hear Scotland is Scottish kilt. The Scottish feel very proud of their traditional clothes. Kilt despite his not too long history in Scottish culture is considered as Scottish national outfit. In traditional Scottish wedding, the groom and male guests wear kilts. Brides can sometimes put on the national outfit as a tartan plaid. But mostly wear a white wedding gown. In wedding decorations, they use tartan, flags and the thistle. The thistle has special important meaning for the Scots. There is a legend concerning this herb. One evening the Vikings were preparing to attack the village. One of them pricked himself with a thistle. He cried from pain so loudly that the villagers have heard him and went out to defend themselves. There are different variations of this legend but all of them show the thistle as a defender of Scotland. Because of this it’s very popular among Scotts as a decoration and takes its place in the wedding bouquet. Scotland with its weddings on the background of castles, endless, green and unforgettable views are so amazing and great. The Scots can make any wedding colorful and romantic, from country style weddings to the wedding in a church or luxury wedding in a hotel. The bride and groom look very unique and amazing. The Scottish weddings rightfully take its own place among the most popular weddings in the world. 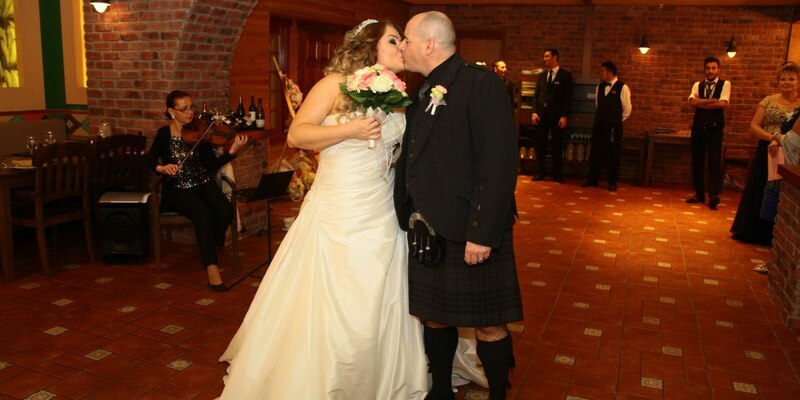 The romantic weddings with the magical sound of bagpipes.